Blue Streak was in many ways a british counterpart to the american atlas rocket. 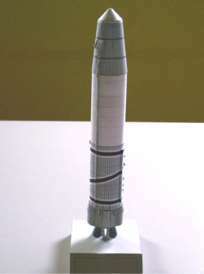 This model in 1:96 resembles one of the testfirings in Woomera. The development of the Blue Streak missile began as an attempt to develop a British nuclear missile. In 1957 De Havilland began the design of the rocket, licensing the tank construction from Convair Atlas rocket. Rolls Royce started to develop an engine based on the North American S3 motor for the Thor rocket. But in the end Rolls Royce redesigned the engine to save weight. The Blue Streak did not use storable fuels, and that meant, that a refuelling would take about five minutes. 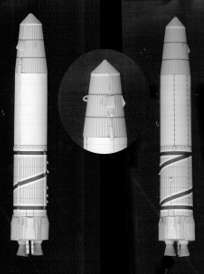 By striking first, the USSR might be able to eliminate the Blue Streak launch sites. That was one of the reasons that Blue Streak newer went into active service as a missile. In January 1960 when the first Blue Streak was shipped to Woomera in Australia for test firing, the missile programme was cancelled. 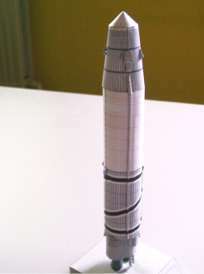 In 1961 the took initiative to develop Blue Streak in to an joint European launcher, and in 1962 ELDO (a predecessor for ESA) was formed. Blue Streak was tested as the first stage of the Europa launcher. The first Blue Streak was testfired June 5, 1964. 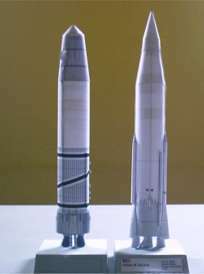 In total ten Blue Streak were fired, of which seven were part of Europa-rockets until 1971, when the Europa project was finally cancelled – see the history of Ariane 1.